Free Unit study on the Country of Haiti. This study includes inspiring information on everything about India including Culture, Food and Geography. 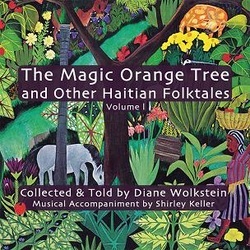 Short biographical studies of famous people who made a difference in Haiti. More than just geography lessons. This study was designed to produce thought provoking questions about the poverty in Haiti. Children participating in this study look at varieties of way countries and ministries are reaching out and making a difference today in Haiti -especially the resources after the earthquake where 250,000 people died..
One of the events that defined our modern world. In October 1779, over 500 free Haitian blacks fought against the British at the Siege of Savannah. They fought and died for the independence of the American colonies. As it stands now, the monument features statues of two Haitian troops with rifles raised on either side of a fellow soldier who has fallen with a bullet wound to his chest. The fourth statue, a drummer boy, depicts a young Henri Christophe, who served in Savannah as an adolescent and went on to become Haiti’s first president – and ultimately king – after it won independence. January 8, 1811, almost 32 years later, the largest slave revolt in American history occurred near New Orleans. Between 200 and 500 black slaves marched on New Orleans. It was brutally put down. 95 were killed or executed, and the leaders had their heads put on pikes(one leader, Deslondes, was mutilated and then burned alive). The fear from the size of the slave revolt ended French settler opposition to American soldiers entering the new Louisiana Territory. What does the 1811 German Coast Uprising have to do with Haiti? Many of the slaves involved in this uprising were brought there against their will by slaveowners fleeing the Haitian Revolution. In fact, the inspiration for this revolt can be traced directly back to Haiti. Copies of the French Declaration of the Rights of Man were found in slave quarters.About 20 years earlier the government of Haiti had outlawed slaves reading the Rights of Man under pain of death. 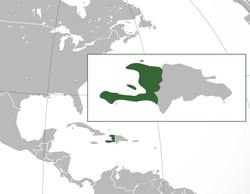 The United States never recognized the independence of Haiti until 1862. What could have happened in those 32 years to change things so much? The answer to that question starts in the streets of Paris and ends on the burnt and bloodsoaked battlefields of Haiti. 1) It was the only completely successful slave revolt in all of human history. Think about that for a moment. Slavery had existed and slaves had been revolting for tens of thousands of years, long before the start of recorded history. During those tens of thousands of years people had also been dreaming of the day that slavery would be outlawed. They were considered utopian idealists. Slavery had been around for so long it was considered part of the human condition, just like war and wealth inequality. It was Haiti that proved all the skeptics wrong. 2) The slaves of Haiti overcame increadible odds. To put their revolution into perspective, let's compare it to the American Revolution. The population of the 13 Colonies in 1775 was 2,400,000. The British army and German mercenaries in 1779 had around 60,000 men in arms in America, although that included Canada and Florida. Around 25,000 colonists died directly from the war, for a ratio of 1 in 96. 6,000 French and Spanish allies also died in our cause. The war lasted 8 years. Haiti, OTOH, had a population of just 520,000 at the start of their revolution - 452,000 black slaves. In 1802 Napoleon sent an armada of 43,000 soldiers to defeat the slaves - nearly the same size of army the British used against the entire American Colonies. 90% of those soldiers never returned to France. Speaking of the British, the rebellious slaves defeated their army three years earlier. The British lost 80,000 men to battle and disease in Haiti, far more than they lost in the American Revolution. The slaves also defeated a Spanish army. And before that they defeated another French army. No one knows how many Haitian slaves died in this revolt. However, estimates generally put the number between 150,000 and 200,000, for a ratio of 1 in 3. Unlike the American colonists, the black slaves had no allies. The war lasted 13 years. 3) The Haitian Revolution ended the global slave trade. The Abolition Movement was making some progress before the Haitian Revolution, but its successes were limited to the gradual phasing out of slavery, freeing future children of slaves, in states such as Pennsylvania, Connecticut, Rhode Island, New Hampshire, and outlawing any new slavery in the Northwest Territories. Massachusetts outright abolition was an outlier. Only the nations of Portugal and Russia had outlawed slavery before the start of Haiti's Revolution. Within 4 years of the victory of Haiti's slaves in 1804, Britain, Denmark-Norway, and the United States had outlawed the global slave trade. A few years later Spain outright outlawed slavery except in its Caribbean colonies. Netherlands abolished the slave trade a few years after that. This is not a coincidence. As shown by the 1811 German Coast Uprising, slaves defeating their masters can inspire other slaves to revolt. The only way to stop that from happening is not allowing the slaves to interact and transfer dangerous ideas. Influenced by the slave revolts in most of its Caribbean colonies, and by the leftists who executed the King, France outlawed slavery in 1794. However, Napoleon reintroduced slavery in 1802. France didn't finally outlaw the slave trade until 1818. 1. The Louisiana Purchase may not have been made had it not been for Toussaint Louverture. 2. Louverture freed the slaves of Haiti in the only permanently successful slave revolt in history. 3. 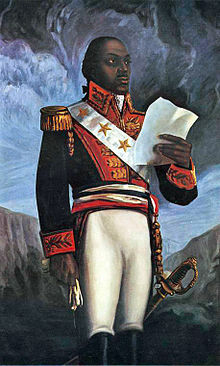 He developed the idea of dominion status for Haiti as part of France. Rejected by Napoleon, the idea subsequently was used by Great Britain 66 years later on July 1, 1862, when Canada became the first dominion. 4. He wrote the first constitution for Haiti. It was the second constitution for a republic in the Western Hemisphere. 5. He was the greatest Black general in history, except for Hannibal 2000 years earlier. PBS produced a show on Toussaint Louverture - there is some violence as it depicts a revolution. Haiti turned around and helped the Latin American Revolution. Because of that support the powers that be punished HAITI financially refusing to trade with the country, US, Great Britain, Spain...all pretty much ganged up on Haiti. Haiti was forced to pay to France BILLIONS of dollars because the former slave owners lost their property (the slaves). It too a CENTURY to pay off that 'debt'. Parents: please prescreen these sites to make sure they are appropriate for your family. The Haitian Revolution was influential in slave rebellions in American and British colonies. In 1807, Britain became the first major power to permanently abolish the slave trade. After watching the video discuss the following: The students claim that the Haitian Revolution was actually the most detrimental thing to happen to HAITI. Do you agree? If you were part of the country leadership what would you do to improve the quality of life for the people of the country? Why do you think the schools in Florida have a whole unit study in their curriculum about the country of Haiti? read this article about HAITIAN history. Summarize it. Read the article Haiti and the end of the Slavery. m = focus on the quote below. What do you believe the author wants us to understand and appreciate? This article is an example of persuasive writing. Does he convince of his ideas? Why or why note. Liberty is not obtained by idle words or incessant talk. Rather, we gain our freedom by commitment, sweat and those who are prepared to make the ultimate sacrifice. Therefore, it is appropriate that we remember the resistance of our own Negre Maron (Maroons) in the mountains such as Jaco, Balla and Congoree; those who burnt the suffocating cane fields and the Haitian Revolutionaries who made that sacrifice. While we remember Wilberforce and the humanitarian component, let us never forget those who paid with their blood.